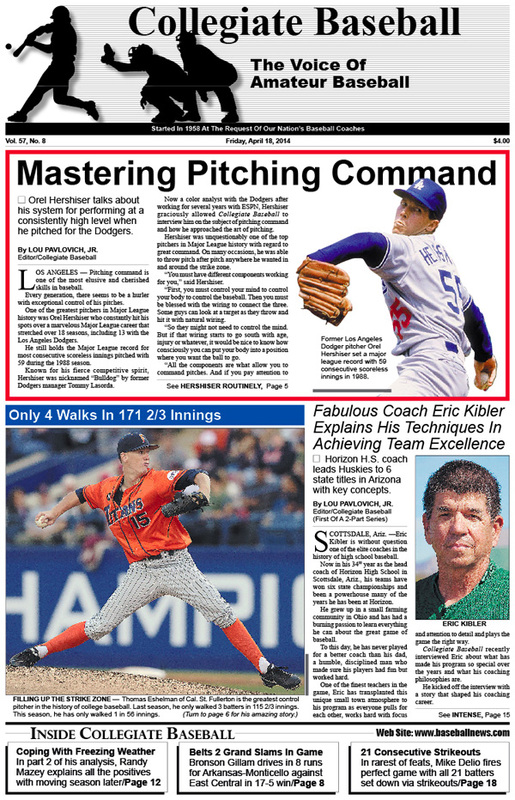 • Former Dodger pitcher Orel Hershiser explains his remarkable system for performing at a consistently high level. • Thomas Eshelman of Cal. St. Fullerton is the greatest control pitcher in college baseball history and explains how he developed great command. • Eric Kibler leads Horizon H.S. (AZ) to 6 Arizona state titles with interesting techniques that allow for excellence. • Johns Hopkins’ math wizards use their expertise to streamline schedules in baseball. • USA Baseball names its 2014 18U coaching staff. • Special column: Should single elimination be a part of NCAA Division I playoffs? Rob Nelson comes up with a unique plan that could pump millions of dollars into game. • NCAA Division 2 Notes: Southern New Hampshire pitchers strike out 22 batters in game to set new record. • Intriguing New Products: Collegiate Baseball takes a look at items that will help baseball programs. • Paul Reddick explains how to work in baseball instruction arena with great results. • Ruleball With Rich Marazzi: Running violations come in many shapes, forms. • Freezing Weather Is For Penguins: Part 2 of Randy Mazey’s in-depth analysis of why college baseball must move its season into warmer weather. • NAIA Notes: Tabor’s Jacob Webb strikes out 29 batters over 14 innings. • Collegiate Baseball’s National High School Poll: Archbishop McCarthy No. 1 with 19-1 record, 15-game winning streak. • High School Notes: Mike Delio of Carle Place H.S., N.Y. strikes out all 21 batters in rare perfect game. • Junior College Notes: Long Beach City’s Manuel Barragan extends scoreless streak to 24 innings. • NCAA Division I Notes: Texas skipper Augie Garrido becomes winningest coach in college baseball history with 1,894th victory. • NCAA Division 3 Notes: Joe Mendez hits for home run cycle over doubleheader. • Charlie Greene Instructional Clinic: Search for safe, efficient mechanics never ends. • Tom Kovic: 5 important factors crucial in initial college list. • Former Heartland Community College player Michael Collins dies from massive injuries sustained in automobile accident. To order the April 18, 2014 edition of Collegiate Baseball or subscribe, CLICK HERE.